What’s Your Experience With Film Photography? As many of you know, I’ve been addicted to film photography for about the last year. And maybe its just the crowd that I associate with, but it seems like more and more people are shooting film lately. Some are picking up their old film cameras for the first time in years. While others are brand new to film photography. So where do you sit with film? I put a small set of answers in the poll below, so try to fit your own experience to one of the items listed. If your own situation is a bit unique, leave a comment and let us know! Also, check out the results from the last poll titled “How Much of Your Work Do You Share?” The question was based around what percent of your photos actually end up online where other people can see them. I’m a bit surprised at how heavily the answers came out to one side of the spectrum. Are You Film, Digital, or Both? What’s On Your Photography Wish-List? This entry was posted in Film, Reader Poll and tagged experience, Film, photography, poll, question on March 19, 2009 by Brian Auer. Film to digital and back again. It’s been four years (or more) since I went completely digital. Just went back to film a couple of weeks ago, I think. I can’t let go of digital since we need it for work, but man, I’ve missed film. Jeff started out with digital and he’s having the time of his life with film now. Film to digital and back again. Started with 110 when I was little, and then 35mm in an Olympus XA. Grew up, went to a Kodak PnS digital, reached the limits of that. Bought a PnS super-zoom Fuji, reached the limits of that and then got obsessed with film, corrupting everyone in my path…..
used to shoot film, but no more. Film is dead. Mainly because I dont have the time (justs check out Brian’s tweets to see how much time film -consumes-), or the money, or passion for it. Digital is cheaper, I love the clarity and flexibility that digital images come with. Shot film for over 50 years; we didn’t have much choice back then, did we? Got my first digital camera in 2005 and have been shooting only digital since then to date, but I am not committed to "doing only digital". I have scanned a substantial part of my film archive into digital format. I will probably shoot film occasionally for fun. In fact, I have a roll of 116 TriX I plan to use in my Kodak Autographic !A for a few select pix when the weather is nice; might even by a tank and develop the film myself if it is too difficult to get it done locally at a reasonable price. Of course, I would then make hi-res scans of the negatives for sharing and printing. I think my answer falls somewhere in the cracks between the multiple choice answers, so I did not select one. Sometimes life is just more nuanced than that. Started on film several years back and just switched to digital in the last few months. Loving the flexibility and elasticity of the digital process. That said, I have kept all my film and film cameras and continue to shoot with them when it strikes my fancy. Love my toy TLR with Ilford 400! I recently started to shoot film and I must say I’m really enjoying it! Oh, the beauty of film, the fuzzy picture borders, the washed out colours of expired rolls, the wait for a new roll to be developed, the funny smell of chemicals for b&w self-development! I much more closer to photography now that I shoot maybe 1 or 2 rolls a month than before when I used to shoot hundreds of pictures in a single afternoon. Film since `96 with no plans on changing that anytime soon. I started out with digital some seven years ago with a point and shoot. First just as a tool to document stuff, but I soon got snared by the hobby, and after a few upgrades ended up with my current DSLR system. I did notice that many of the images I admire tended to be MF or LF film, rather than digital, though, and I also noted that digital was kind of too fast and easy for me – I tend to shoot without thinking things through, and the results suffer for it. So I got a second hand Yashica TLR, just to play with a little and satisfy my curiosity. You know, try it once, to see what it was like. I got hooked immediately. Today, I probably split my time evenly between film and digital, I develop BW myself, I have two more old MF cameras, and I’m currently being completely torn over which "real", high-quality MF camera I should get this spring (it’s more or less down to the Pentax 67 or Mamiya 7 at this point). I got my first film camera (a point and shoot) in junior high, and an SLR in high school. I moved to digital in college (though honestly I didn’t shoot all that much in college). I think I learned more and got more in my first week with a dSLR than I ever got with film. In the four years I had a 35mm SLR, I took just over 1,000 photos. Now I’ll do that in a weekend. With film I was always conscious of "wasting" it – it was expensive to get, expensive to develop. So I never experimented. Never took a lot of shots. With digital it costs nothing to try something and I get instant feedback as to what I’m doing right and wrong and correct myself. With film there was such a delay between taking the picture and seeing the result I found it nearly impossible to learn. I’d probably be better with a film camera now than I had been before given what I’ve since learned about photography thanks to digital, but I can’t see myself ever picking it up again – I just don’t see the point. Well I started shooting film with my first camera I recieved for Christmas back in 1962 ! A Kodak Retiniate 1A, which I still have. I swiched to digital in 2004, and it rekindled my intrest in photography. I sort of lost intrest persuing my career, and raising a family. I do miss the quality of film, there in nothing like a black and white fprint from film. But then again I don’t miss messing around with the chemicals. I learned on film back in high school. I shot B&W exclusively through high school and college and a little after wards. At the time, I had facilities (mostly at school or in my parents basement) to develop it myself. But as I moved on in life, I don’t anymore. I got into digital for two major reasons: 1) Because I no longer have the facilities to handle myself. 2) Because the costs of doing film – especially when you can’t develop on your own – are difficult to justify on tight budgets like mine. I still love film, but I also love digital. I think each has its advantages and disadvantages. So I’ll still shoot film every once in a while, but I stick primarily with digital. I started with a Kodak Brownie when I was 6 (in 1961), moved up through a succession of SLRs. Did a lot of my own darkroom work as a teen (had my own darkroom off my bedroom) and in college. Then backslid to small film formats and snapshots as a family came along. Got a P&S digital a few years ago and dSLR 18 months ago. I haven’t looked back. About the only thing I miss from film is its gentler handling of overexposed highlights. When ever I can take a break from digital I shoot film as a way to relax. I think I want a Keiv 60 next. it’s an addiction. It’s cool to see all the photographers psyched about film. I bought a Canon EOS 1D when it first came out and held onto my EOS 3 for "serious photos." Never used it again – ha! I don’t know how many DSLRs I’ve had since then. But film is something in my past. 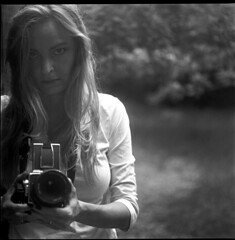 And aside from infrared or the Holga I don’t see myself using it again. I need the speed, predictability and control that digital offers. I worked in commercial labs for years and I don’t miss the chemicals, either. Who knows what kind of damage putting your arms up to the elbows in blix does to you. It can’t be good. But I do miss the smell of black and white fixer. That’s a memory-triggering smell. Years in the darkroom will do that to you. The thing about film is it’s magic. There’s no digital equivalent of watching a print come up in the developer and getting your fingers in there and rubbing a spot to bring it in stronger. The visceral quality of film is irreplaceable. But it doesn’t fit into my world anymore. Still, I have noticed a resurgence of interest in film. I’m especially entertained by all the photographers who started out with digital and are now getting into film. They should get to experience the magic and I hope everyone who’s learning to shoot film gets some darkroom time. Because you haven’t really shot film until you’ve developed and printed it yourself. You need to get intimate with it. I shot film back when I had to… I switched to digital when it came out, and I’m never going back. I guess you could technically say that I shot film in my youth. I had point and shoot cameras and that is all we had. Since I have been concentrating on photography I have mainly been a digital shooter however I have been playing with toy cameras as a way to get into film photography. It takes me forever to finish a roll, but I am having fun with them and it is an easy way to get into film. I even started a photoblog just for my toy camera work. As a kid I used 127 roll film as well as 126 & 110 cartridge film. In my twenties (mid 80′s) I acquired a Pentax Spotmatic F and started getting more into photography. Hard times saw me sell that camera and not do any photography (my wife became the family photographer with a 35mm point & shoot) until I got my first digital camera (a used Sony Mavica FD7) in 2000. Since then I moved through a few digital point & shoots, bridge cameras and DSLRs but I also acquired a Praktica MTL 50 in an attempt to recapture my love of the Spotmatic. I don’t shoot a lot of film but every so often I get the urge to run a film through it. I answered I used to shoot film but no more. But….I’m going to go back for the fun and for a different and unique camera like a Holga. I find digital a blast with all the new creative things you can do with an image that you can’t film. Digital is a lot more affordable in the long run too so that really helps. I use to develop black and white for fun and I can still smell the chemicals like it was yesterday. It’s really interesting hearing how everyone has progressed through their photography. I started off in digital, but then decided that to be a photographer, I needed to know how to use and develop film as well, so I learned that. Now, I mainly shoot digital, but only because of time restrictions and practicality. I have several film cameras in many different formats (I really love the older, quirky cameras) and use them every once in a while when I have time to "play," but all of my professional work is done on digital. Nothing can beat the high of waiting to see what came out on a roll of film though. Film other than a rare exception is the past for me. Environment unfriendly chemicals, delayed return of images, images that lose sharpness when scanning for photos online, and costly/diminishing film stocks. I might use film in the future for select projects, but for the most part I have no interest in returning to it. Digital provides me so much more than film ever did. Pingback: What’s On Your Photography Wish-List? I began shooting stills when I was a kid in the 1970s. I retired my 35mm Canon cameras in 1998. In November 2008, I pulled my Canons out of storage and began shooting again. I recently have discovered the Pentax Auto 110 SLR camera which uses 110 film cartridges. I’m now shooting daily for fun! As I just came back from B&H with 5 rolls of Kodak porta 400VC (120) I read this last entry. and Just wanted to Reaffirm my total love for film. I shoot digital for a living, but there is something about film that digital just can’t replicate. Now, don’t get me wrong, I love digital. Digital pays the bills. but there are more and more people out there shooting film and getting involved in processing now then a few years ago. And as anyone who has been to B&H, Adorama or gone on line to places like freestyle know there is NO shortage of film stock. One of my favorite films is one that Kodak JUST RELEASED is Kodak Ektar 100. (If Kodak is developing new film for Professional Photographers, you know that film is far from dead!) Which I’ll shoot a roll of at a wedding I’m shooting this weekend and will offer the film prints to the Bride and groom as a Special Gift added on to their package. I use both Digital and Film. I shoot Digital to get and actual look at my composition and lighting. If I really like the photo,I will shoot it on film. The film storage life is long and can be saved in the real physical world. Digital images may be lost due to accidents in filing, system crashes, or medias becoming obsolete in the future. In addition to the fact that instant shooting in cases where something happens fast and the scene is not the same as your last settings, (ISO,WB, etc,etc) you stand the chance to lose a great shot. I use film for on the street shooting, where there is no need to see the picture instantly. I started at the age of 20 with a Praktica LB …, use witth a Zenit 122, a Fed 5 and a Zorki 4 in the ’90, use digital from 2005 to 2009 … now return to my lovely Praktica LB and bought a new MTL3 and MTL5 and a lovely Zenit E… film is alive!